You probably heard that Equifax was just hacked — and there’s a 75% chance you’re affected. Note: we were going to include a link to the Equifax checker, but we’ve since found that Equifax buried fine print in the use of their tool: namely, that by using their tool to see if you were affected, you waive your right to participating in a class action lawsuit. According to Bloomberg, federal lawmakers and a state attorney general have gotten involved to condemn Equifax for this arbitration clause. So we’ll leave the link out for now. The US government (including the IRS database) was recently hacked. Verizon was hacked. Yahoo was hacked. Target was hacked. Which means thieves right now likely have access to your name, birth date, driver’s license number, and address. Simply put, these thieves can match up information from all these different breaches to access your bank accounts, credit card info, tax returns, investment accounts, and more. So it pays to keep your information secure. Because doing nothing could mean you’re in for some nasty surprises. Or logging into your bank or brokerage account and finding it emptied out with a $0 balance. This is not science fiction. These things have happened to honest hard-working people just like you. Worst of all, the most vulnerable businesses are single owner and family businesses. Imagine a family-run business doing business for generations… here one day, closed the next. All because they didn’t take some simple protective measures. There’s no need to wipe out your wealth because of a simple security error. 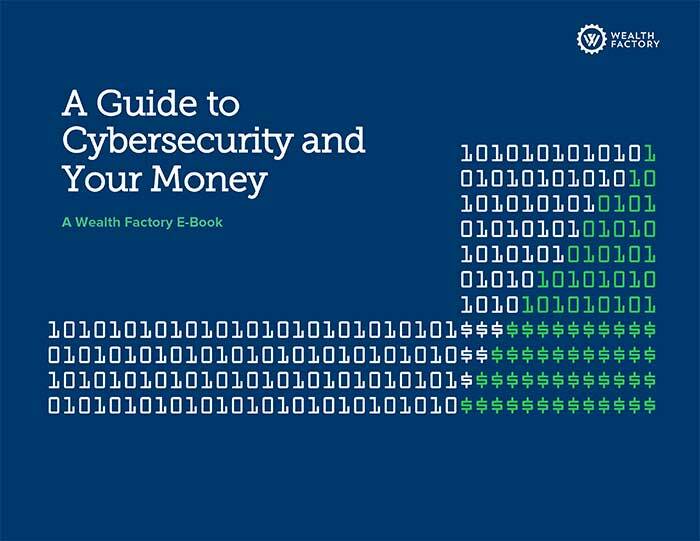 Now, it may seem overwhelming at first trying to secure your wealth from cyber hackers and financial predators. Still, there are a few simple steps you can take to keep the bad guys at bay. We’ve put together a special guide with a quick list of action items. The guide is free of charge to help you easily navigate through all the complexities. Using this guide gives you a great start at securing your wealth. Articles and insights about personal finance that you won't get anywhere else, designed for business owners. Unsubscribe any time with a single click. From asset protection to tax strategy to building a family legacy ... these are some of our thoughts on building wealth and keeping it, for business owners and entrepreneurs. Wealth Factory's mission is to help 1 Million Entrepreneurs and Business Owners build their own Wealth Architecture by 2020. We’re committed to helping entrepreneurs keep more of their money by increasing monthly cash flow without having to cut back, budget, take on more risk or increase sales. Disclaimer and Waiver - Wealth Factory, LLC®, its owners, officers, directors, employees, subsidiaries, service providers, content providers and agents (referred to as "Wealth Factory") are not financial or investment advisors and not licensed to sell securities or investments. None of the information provided is intended as investment, tax, accounting or legal advice, as an offer or solicitation of an offer to buy or sell, or as an endorsement, of any company, security, fund, or other offering. The information should not be relied upon for purposes of transacting securities or other investments.Your use of the information contained herein is at your own risk. The content is provided 'as is' and without warranties, either expressed or implied. Wealth Factory does not promise or guarantee any income or particular result from your use of the information contained herein. Under no circumstances will Wealth Factory be liable for any loss or damage caused by your reliance on the information contained herein. It is your responsibility to evaluate any information, opinion, advice or other content contained. Please seek the advice of professionals, as appropriate, regarding the evaluation of any specific information, opinion, or other content. Get articles and insights about personal finance that you won't get anywhere else, designed for entrepreneurs. Download the PDF: "32 Jobs Your Child Can Perform in Your Business"
Plus get our weekly newsletter packed with other great tips our clients use every day to cut tax liability, increase cash flow, and add more fun to business. YES! SEND ME THE CASH FLOW BANKING MINI-COURSE. We respect your privacy. We promise never to share, trade, or sell your email address in any way, shape, or form.